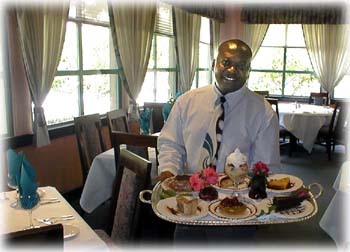 Sweet Temptation: Mohamed Janneh shows off the decorative desserts available at Tivoli. THOSE OF US WHO TRAVEL for business reasons know the value of a good hotel restaurant. Every time we arrive in a new city, we cross our fingers, hoping that our place of lodging has an establishment where we can count on good food--and, perhaps, a little more. Tivoli, a restaurant adjoining the Sheraton Hotel in Milpitas, soothes the frazzled traveler with that extra something. It is a strangely romantic little place--strange because a group of corporate diners may feel as much at ease as a romancing couple. A muffled softness coddles the patrons, and the room's classy ambiance is charged with possibilities, business or otherwise. After dark, the dining room glows an Arizona desert blush, its walls busy with paintings. Plants, gleaming bronze fittings and dark wood trim define the business tone; however, the room is dim, not conducive to reading, and the night outside seems brighter. Comfortable booths and chairs face expansive windows that look out on a lighted fountain and palms in the courtyard below. One evening we took a table amid a flock of suits, some winding down for the day, some gearing up for a sales pitch, others enjoying a flirtatious interlude. The bar made business and pleasure flow more easily with a well-priced wine list and a selective array of cocktails. Among the libations available as social lubricants were a Tuacacino (cappuccino laced with Tuaca), an Italian Stinger (Remy Martin and Galliano) and a Negroni (Bombay gin, Campari and vermouth). Upon the arrival of a napkin purse full of hot, crusty foccacia, we poured a pond of dawn-green olive oil from a tall cruet, painted it with balsamic vinaigrette and                                                                                                                                                                                                                                                                                                                                                                                                                                                                                                                                , the soup, zuppa di cipolla ($4.95), evokes memories of Fisherman Wharf's clam chowder in bowls of sourdough bread, but this was an Italian concoction of similar texture and contrasting taste highlighted with a baked crown of mozzarella and Parmesan. Sweet onions caramelized with sherry were blended with a smooth cream base and poured into a bread bowl. A little more sherry and deeper caramelization and this soup could have been a meal in itself. Our eyes, struggling in the faint light, trawled through the staggering list of main events, including beef Wellington, Chateaubriand, pizza, seafood fettuccine, capellini pomodoro and prosciutto-filled tortellini--nearly two dozen entrees. Notably absent were some northern Italian rice classics. We settled on pollo alla rustica ($13.95), a well-worn recipe of grilled chicken breast in a heavy gravy of garlic, sun-dried tomatoes, prosciutto and sweet Madeira wine. Sided with a hefty mound of garlicky mashed potato and a bale of steamed green beans and carrot blades, the chicken made a hearty meal, the thick flavor of the gravy beguiling the slight nature of the white meat. Our other selection, the gamberoni ($19.95), was a compelling feature: a prawn quintet misted in lemon garlic butter and banked against a knoll of fluffy wild rice. Butterflied into snow-white petals, each prawn was folded over a pillow of blended Dungeness crab that was very rich--and consequently a little off balance. The prawns were flawless, but the crab needed more attention. For dessert, we chose two distinguished escorts to close the meal. The zabaglione ($4.25), its layers of fresh strawberries bedded between clouds of pastry cream made with wine, offered a refreshing lightness but would have been more successful chilled. The butter-rich chocolate torte ($4.95) mingled semi-sweet chocolate with a moist, nutty crust, making the smoothly textured creation one of the best desserts we've had in a long time. Copyright © 1997 Metro Publishing, Inc.